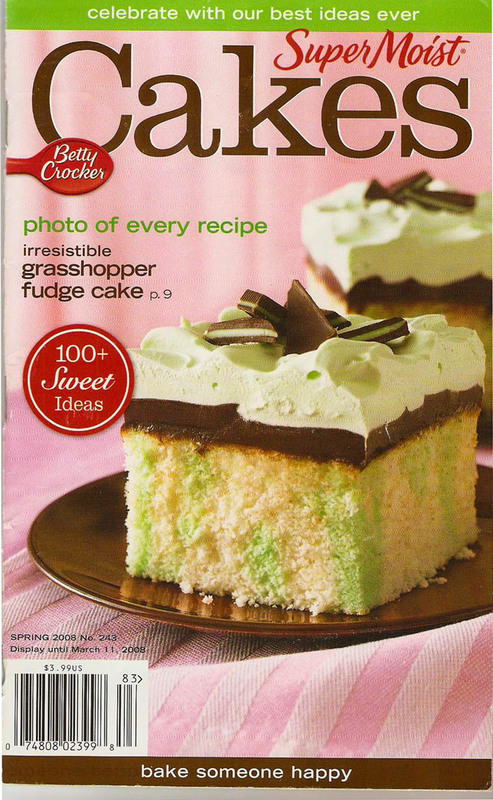 Here's the 2008 Betty Crocker Super Moist Cakes paperback cookbook. The recipes in this booklet all use a mix and are different ways to use mixes to produce great cakes without much time and effort. Well, I guess the effort might not be correct for all the recipes, but still much easier than from scratch. I like the flavor and texture of cake mixes and have used them since I was in high school when they first came on the market. I must admit I didn’t make cakes a lot before that. Now, frosting mixes are a different story and I don’t use them and where they are called for in here I will make the frosting by hand. I will give the directions both ways. Many people use frosting mixes and so would like the directions for something different to do with them. Sue says: I'm not a cake baker or a mix user as a rule, but Myrna talked me into baking at least 2 recipes from this book; and we did enjoy them. We think you'll enjoy this book too. The only cake mix I've used in years is Betty Crocker's Supermoist White Cake Mix; my homemadewhite cakes have never turned out quite right and the mix is simply an easy way to get results I know will be perfect, and I don't bake cakes often. I know...preservatives, additives, and 'way too much fat and sugar, but small things when Steve and I want something sweet or a family celebration begs a fancy, dolled-up cake. In an effort to at least minimize the cholesterol issue, I prepare the mix with egg whites. My slightly overweight body forgives me this small indulgence.